First came the Drift Mode on the Ford Focus RS and now comes the Drift Stick to enable users to make old-school handbrake turns just Ken Block does in his Gymkhana videos. 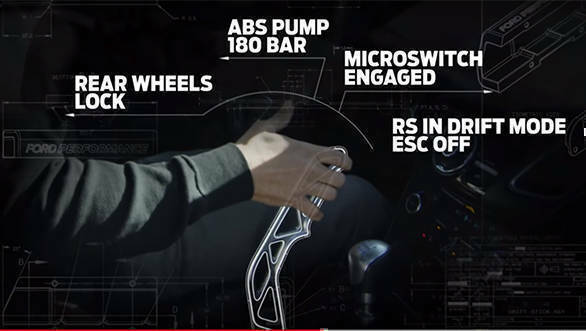 Ford Performance, the performance arm of Ford Motor Company, has come up with the Drift Stick for the Ford Focus RS. 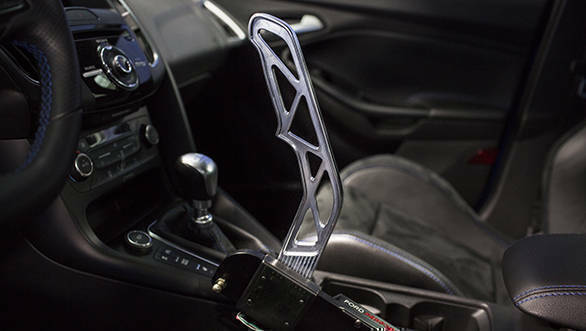 The Ford Performance Drift Stick is the first electronic handbrake designed to work in conjunction with the Focus RS' all-wheel drive system and ABS. The system comes complete with a solid aluminium stick lever that attaches to the car's electronics via USB and fits between the driver and the gear lever. It works well enough for notorious drifter Ken Block to give it a thumbs up. Going for a full hydraulic handbrake brake system would have required a complete rework, instead of which Ford went with the electronic Drift Stick. When pulled, it opens up the rear drive-unit clutches and applies hydraulic pressure to the rear wheels so as to lock them up. That way drifting is possible but without the use of the clutch.